Berkeley Jet Drive: 148100-8 - Installation Kit complete with 8 feet Hose, Stainless Steel Thru-Hull, Hose Fitting & 4 Stainless Steel Clamps. from California Marine. 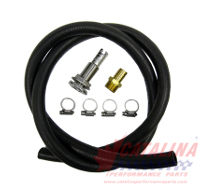 Description Installation Kit complete with 8 feet Hose, Stainless Steel Thru-Hull, Hose Fitting & 4 Stainless Steel Clamps.